A joyride lands a Florida man behind bars because the joyride... was on the lawn of the local jail. The incident happened Monday around 7 p.m. at the Hernando County Detention Center in Hernando County, located on Florida's west coast. 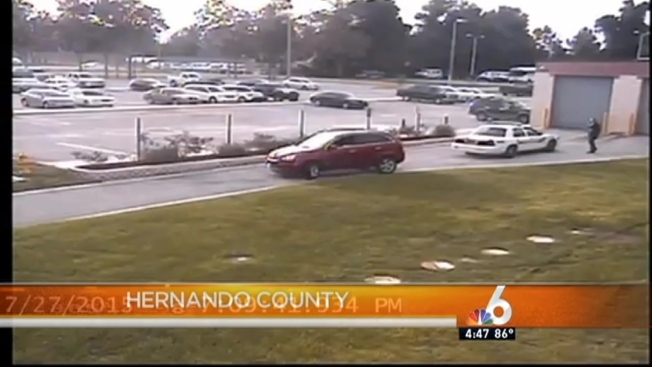 According to a release from the Hernando County Sheriff's Office, the driver, Michael Lee Roberts, drove his red SUV right up to the main entry and exit door at the detention center, parked and got out the vehicle. Deputies notified Roberts that he couldn't park his vehicle there, but he refused to move and attempted to keep walking into the detention center. After arguing back and forth, deputies say Roberts got into his car and backed down the walkway, hitting a bench. Roberts then hit the gas and proceeded to plow through the lawn, making a full circle and ultimately slamming into a flag pole. Deputies ordered Roberts out of his vehicle and placed him in handcuffs for what would turn out to be a very short walk to the jail. Roberts was charged with criminal mischief and resisting an officer without violence. He was ordered held on $4,000 bond. It is not known whether Roberts has hired an attorney.